Finland [FIN]: as“Korppi” in Shokki tekijänä Richard Corben #2 (2014). France [FRA]: as “La corbeau” in Creepy [FRA] “annual serie” #25 and Edgar Poe [FRA] (1981) and La chute de la maison Usher (1986). 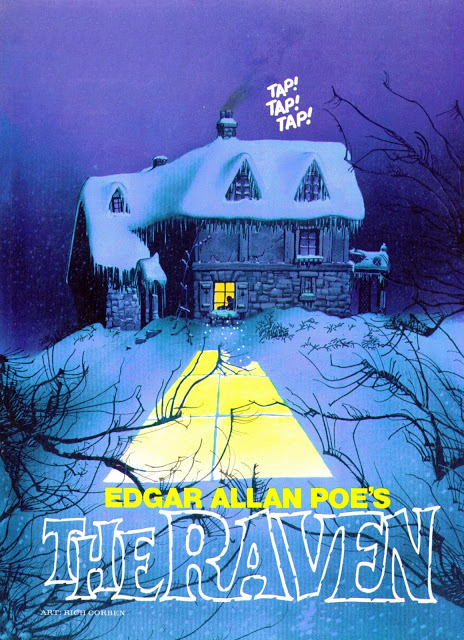 Germany [GER]: as “Der Rabe” in Edgar Poe [GER] (1981), and in Gespenster-Geschichten präsentiert #4: Edgar Allan Poe [GER] (1986). The Netherlands [NL]: as “De Raaf” in Creepy [NL] Special: Edgar Allan Poe [NL]. Serbia [SER]: as “Gavran” in Jeznovik #2: Ričard Korben (2013). Spain [SPA]: as “El cuervo” in Famosos “Monsters” del cine #3 (1975), Creepy [SPA] rinde tributo a Edgar Allan Poe, Richard Corben obras completas #4 (1985). Yugoslavia [YUG]: as “Gavran”, as 2 part series in color in Stripoteka #730 (1982) to #731 (1982). Story Origin: Edgar Allan Poe poem, “The Raven”. Synopsis: There is tapping on man’s door. Raven flies in and quote, Nevermore. A man is waiting news from his long lost love. 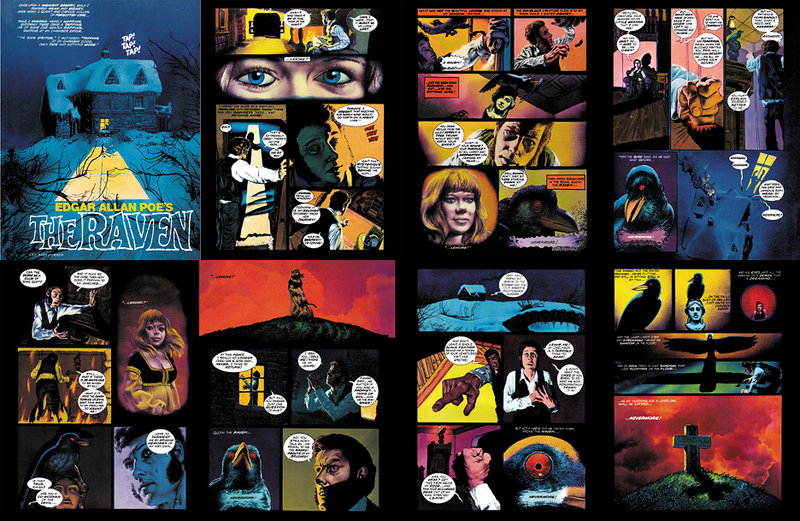 Comment: Corben’s adaptation of Poe’s classic is poetic story and brilliant artwork. Alternatives, [Vers. 2]: All white texts on black or dark color background are turned to black on white or light color background. Alternatives, [Vers. 3]: Poorly scanned from magazine (vers.1). Alternatives, [Vers. 4]: Restored with piety by José Villarrubia. Special: The story was planned to appear for the first time in Creepy #69 (1975), but because a cofusion of the printer it appeared already in two issues earler (on a place of “Bowser”). Instead in a Special Edgar Allan Poe issue they printed a B&W story “Oval Portrait!”. That is why there was no color section in Creepy #69 (1975). Appeared also in B&W for Haunt of Horror by Max Comics (Marvel), “Raven [II]”, and for Dark Horse, “Raven [III]”. Copyright © 1997 Heart-Attack-Series, Ink!